January 03, 2018, 8:30 p.m.
2017 was a good year for the world (at least Republicans thought it was), and Republicans are particularly optimistic about the year ahead, too. In the latest Economist/YouGov Poll, Americans express more optimism than pessimism about how 2018 will treat the world, and they are even more optimistic about how it will treat their own family. A significant number are entering the year with positive expectations for the economy, but there is a different feeling about other issues, including health care, government spending, and what happens next in the Middle East. 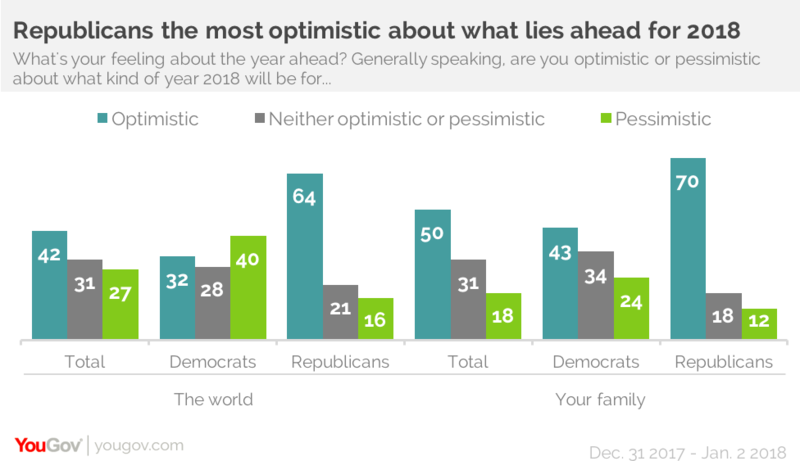 Half the public is optimistic about what 2018 will be like for their own family, more than the percentage who say they are optimistic about the coming year for the world. While less than half of Democrats are optimistic about how 2018 will affect their families, 70% of Republicans expect a good year in their households. Some of this could be financial: in the same poll, Republicans are nearly four times as likely to believe the new tax bill will lower their taxes as to think it will raise them. Democrats believe the bill will increase their taxes. The economy has been a bright spot for the public for much of the year, and more continue to say the economy is getting better than think it is getting worse. 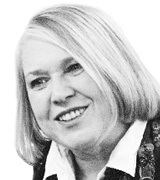 There is more optimism than pessimism about both the local and the national economy. But other issues concern the public: nearly half are pessimistic about health care coverage, 42% about government spending, and 43% about the Middle East. The global situation is troubling for many. 44% believe the United States will become less respected in the world in 2018, and just 26% think the country will become more respected. A majority of Republicans (53%) say the opposite and believe the country will become more respected. But few see any improvement when it comes to safety from terrorist attacks. Fewer than one in five believe the country – or their own community – is safer today than it was a year ago. 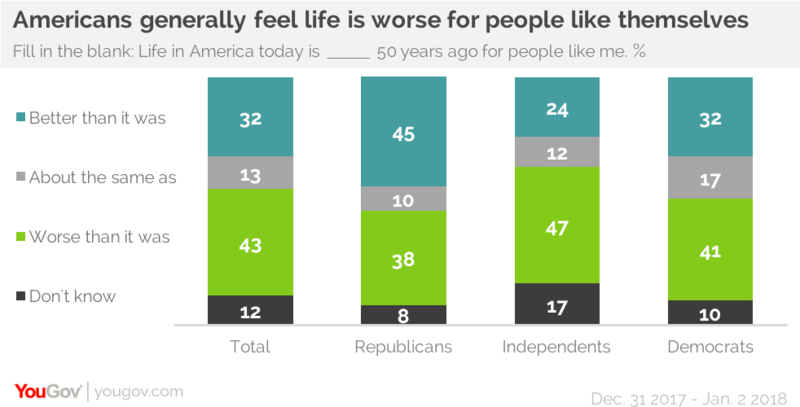 Looking back even further, Americans are quite negative about life today for people like themselves. More say it is worse today for people like themselves when compared to life 50 years ago than believe it is better. In this, Republicans have a more positive assessment than either Democrats or independents do. There is also a difference by income. A majority of those with family incomes of $100,000 or more say life for people like themselves is better today than it was 50 years ago. Last week, two-thirds of the Americans felt that political discussion became more negative in 2017, marking the third year in a row when a majority of Americans saw negative political discourse growing. 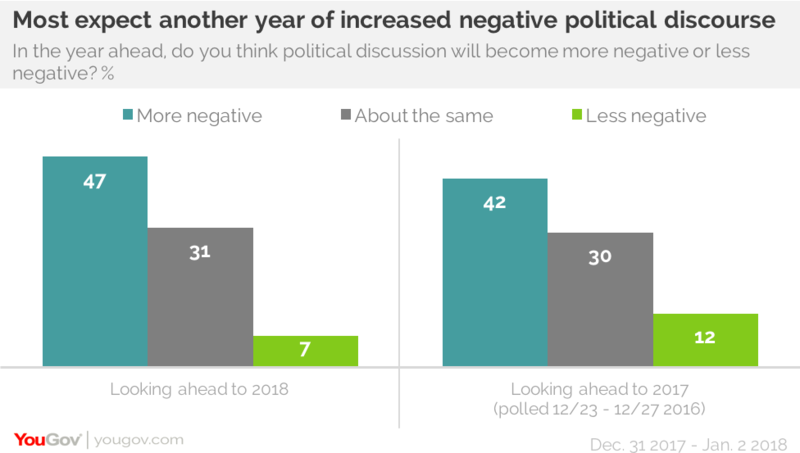 This week, nearly half say that it will become even more negative in 2018, more than thought political discussion in 2017 would be less civil. Democrats are especially likely to think political discussion will become more negative this year. But even with the midterm elections coming in November, most think politics won’t become more interesting. Only 26% of the public thinks that will be the case. Last year, a third of the public and a majority of Republicans believed the new Republican-controlled Congress would accomplish more than Congress usually does. Even though Congress passed a major tax bill at the end of 2017, those positive expectations have dissipated, even among Republicans. 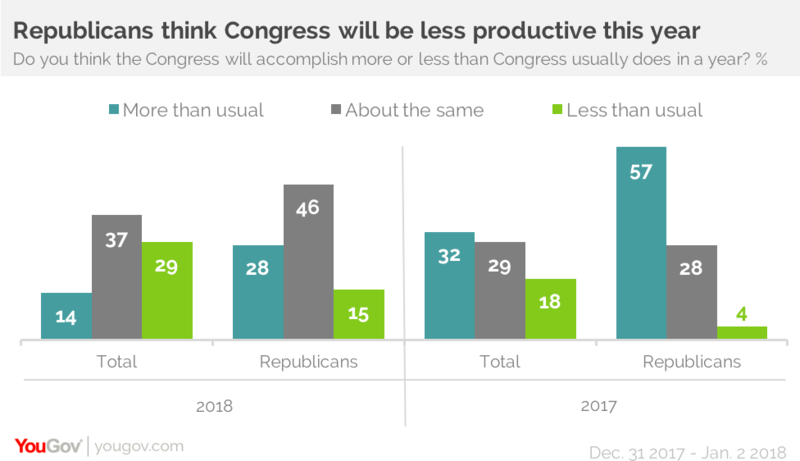 Less than a third of Republicans now think that 2018 will be an especially productive year for Congress. The President’s approval rating remains at 38%. More than half (53%) of the public do not think he can win re-election in 2020, and 46% of Republicans agree. Nearly half overall think he will have even more difficulties in 2018: by 49% to 30%, Americans think Democrats are likely to take control of the Senate after the 2018 elections, and by 44% to 34%, they think Democrats will win control of the House of Representatives. Most Republicans expect the GOP will retain control of both Houses.